With over 25 years’ history, Maxi Sport is Italy’s benchmark chain for casual fashion and technical sports equipment. It has four strategically located stores in the Lombardy region and, since 2002, it has been active on the Internet with the e-commerce maxisport.com. *Coming soon campaigns compared to Maxi Sport’s usual promotions. In all marketing activities, we put the customer at the center of every strategy. We plan every action with the aim of providing outstanding service and an experience that goes beyond expectations. MailUp’s contribution was critical in making Maxi Sport an ideal online shopping partner for so many Italians. To ensure customers have the best possible shopping experience, with no discontinuity between its physical and online sales channels, Maxi Sport needed a solution that integrates all areas of its digital ecosystem – from CMS Magento to CRM Salesforce – to manage and launch multi-channel and personalized SMS and email campaigns. Ultimate goal: to put across a consistent message to the user and manage product data analysis, processing and content production from a single environment. These tasks are only possible with an open and flexible system with segmentation and marketing automation tools that make it possible to build relations with all clients based on their activities and interests. By translating individual customer journeys into practical actions, Maxi Sport has given itself the option of profiling. With MailUp, Maxi Sport now has the technology to develop new strategic lines of communication. In particular, SMTP+ has enabled the brand to send transactional emails directly from its e-commerce, taking advantage of MailUp’s speed, high deliverability and tracking. 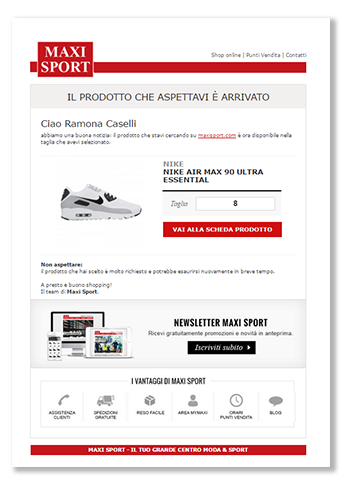 Thanks to SMTP+ and the integration with Magento, Maxi Sport has implemented and launched the new Coming soon feature: a timely email notification system to inform customers that a new or repeated product is available in the catalogue, providing a preferential option for the purchase, be it online or in store. This action ties in with the relevant customer care communications and responds efficiently to an explicit need put forward by the customer. In just a few steps, Maxi Sport set up personalized triggered emails (with the recipient’s first and last name), containing dynamic information about the individual product (images, descriptions, sizes and links to the more detailed description). These advanced segmentation, profiling and marketing automation features make it possible to have a one-to-one dialogue with the customer, campaign after campaign. By integrating the stock data, user preferences and potential of email automation, Maxi Sport has been able to create an extremely efficient flow that transforms a potential pain point (a product being out of stock) into immediate conversion opportunities. The conversion rate of the Coming Soon campaign is four times as much as Maxi Sport’s average, reducing the post-click bounce rate by 3.6%. Thanks to this and other user profiling activities, in 2015 Maxi Sport’s open rates and click-through-open rates were well above industry benchmarks. Create a consistent stream of communications with customers by integrating the in-store and online shopping experiences. Profiling your recipients and, depending on their individual interests, set up triggered messages for relevant and personalized campaigns. Include a selection of related products in your emails, based on each customer’s previous purchases. Boost the loyalty of existing customers: their cost of acquisition has already been paid off with their first purchase.